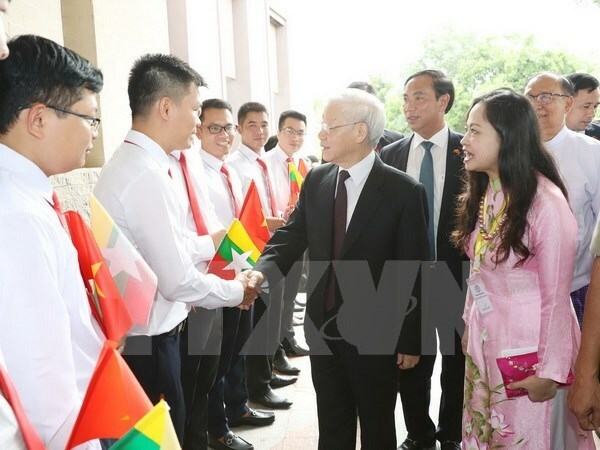 Nay Pyi Taw (VNA) – Party General Secretary Nguyen Phu Trong arrived in Nay Pyi Taw International Airport on August 24, starting his three-day State visit to Myanmar at the invitation of President Htin Kyaw. He was welcomed at the airport by Myanmar’s Minister of Transport and Communications Thant Sin Maung and other Myanmar officials. This is the first visit of a Vietnamese Party General Secretary to Myanmar after the visit of Party General Secretary Do Muoi in 1997. It aims to establish a more specific cooperation framework to create a breakthrough for the bilateral relations, especially in the fields of trade, investment, security and defence. Vietnam and Myanmar established diplomatic ties four decades ago. Trade between the two nations hit 536 million USD last year, exceeding their target and making Vietnam the ninth largest trade partner of Myanmar.